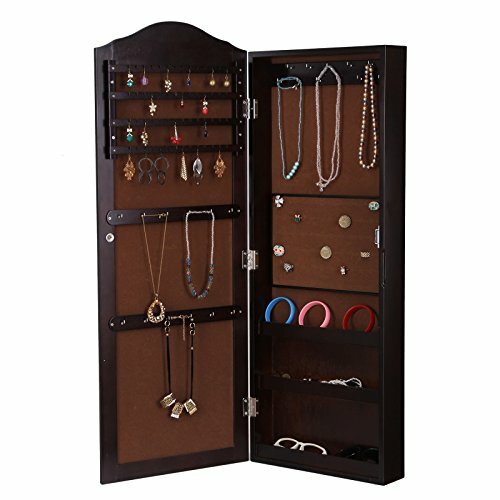 An astonishing and remarkable item of jewelry display, this gorgeous and impressive wooden armoire is by far one of the most amazing and elegant ways in which you can present all of your beloved jewelry items! The armoire has been constructed out of fine MDF and wood as well. It features a beautiful and striking dark walnut design that will definitely stand out. The armoire has got numerous drawers, no less than five separate pull-out drawers. 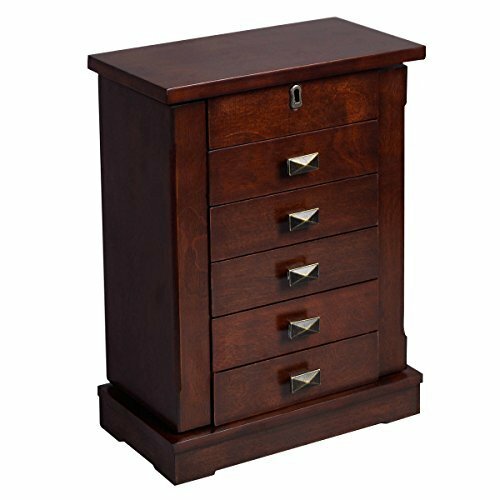 They are spacious and deep so that you will be able to easily accommodate your entire collection of jewelry without a problem. There are two secret side doors as well, both of them equipped with fancy hooks for hanging and arranging all of your necklaces, pendants and bracelets alike. 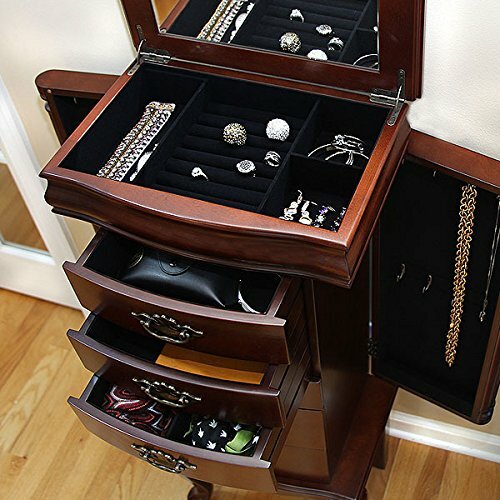 There is another top lid compartment too; it’s got a beautiful and elegant glass mirror and plenty of other slots and ring rolls for your jewelry. 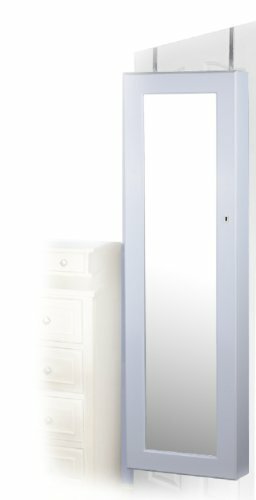 The interior of the entire armoire has been lined up with soft and silky creamy beige fabric that is meant to better prevent any scratching or damage to your jewelry items. 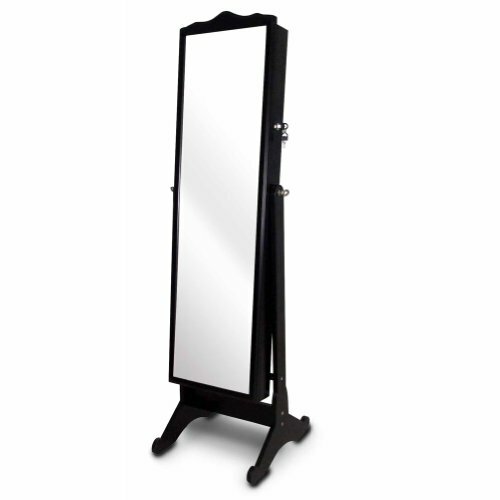 This impressive product can be used in your own home and in any retail shop just as well. It is professional, elegant and attractive and it will definitely provide a most satisfactory display of your entire collection of jewelry! 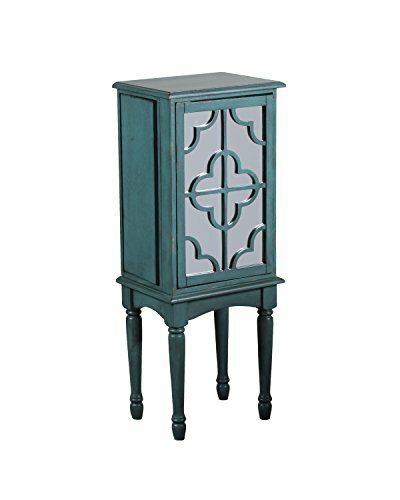 The dimensions of this jewelry armoire are: 9.8” X 5.3” X 13.3” (L X W X H) and the drawer size: 5.9” X 4.3” X 1.5” (L X W X H).